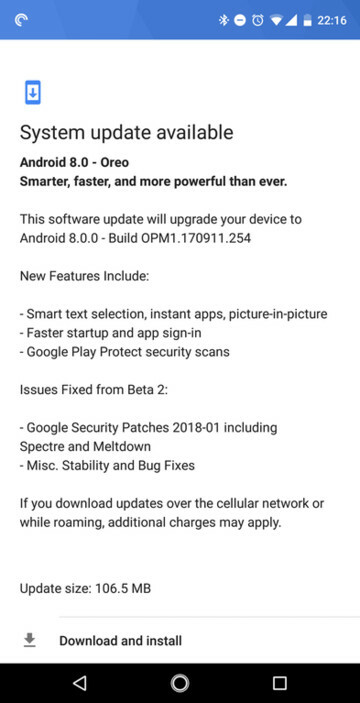 Update: Essential Phones Android 8.1 Oreo Beta 3 with firmware build number OPM1.180104.010. We have already seen Essential Phones Oreo Beta 3 based on Android 8.0 with firmware build number OPM1.170911.254. Now, here is the official Android 8.1 Oreo for the same. The OTA is now available for download along with installation instructions. Essential Phone PH-1 is not giving up on its first phone just yet. Though the phone may not have a lot of users, just above 50,000 according to the stock Essential camera app downloads, the device is getting the latest update. First, the latest December 2017 Security patch, then the latest Android 8.1 Oreo update, and now, the 8.1 Oreo Beta update. The new version of the Beta 4 comes with a firmware build number OPM1.180104.010. This OTA update is quite big compared to the previous Beta updates. It features numerous stability and performance improvements, boot optimizations, support for Project Treble, and much more. First off, the update is based on February 2018 Security Patch. This is the latest Android security update from Google. The Oreo specific apps like the smart text selection, instant apps, Picture-in-Picture, etc. all are getting an upgrade. You will also see a faster startup and app sign-in enhancement with this update. The Google Play Protect security scan has also been included with this new Beta 2. These are all the new features. The manufacturer has also brought improvements to 3.5 mm adapter to fix an echo problem. It is also rumored that the Laser Autofocus issue is now fixed. The Android 8.1 Oreo Beta 1 comes with latest February 2018 Android Security Patch. Other general bug fixes include Dynamic Calendar and Clock Icons, Slow Scrolling Jitter Fix (Beta). The full changelog is listed below. What’s New with Oreo Beta 3? Read: How to flash OTA updates on Android devices?